February’s birthstone is the ever-popular Amethyst. Amethyst is a purple gem whose hue can range from a pale lilac to a rich, dark purple. Its great variety of shades makes it an extremely popular choice for fashion jewelry lovers. Amethyst has always been a much-loved gemstone. Throughout history, this gem has carried symbolic meaning for many religions and cultures across the world. The Catholic Church believed that it symbolized celibacy and piety. Tibetans felt that Amethyst was sacred to the Buddha. 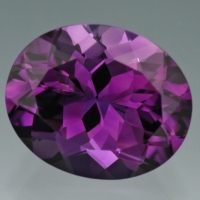 Greeks thought that Amethysts were an antidote to drunkenness (hence the name “Amethyst,” which comes from the Greek “Amethystos,” meaning “not drunken”). The Chinese philosophy of Feng Shui believes that Amethyst enhances your “wealth corner.” Even Leonardo Da Vinci thought that it was able to expel evil thoughts and quicken intelligence. Goblets, rosaries, and crown jewels have all been fashioned from Amethysts. Amethyst is the purple variety of quartz. Mining of this gem is plentiful, as it can be found in Argentina, Bolivia, Brazil, Uruguay, Zambia, Namibia, and many other African countries.